Listening: I don't know if I've mentioned it here before, but we are going to see Fiona Apple live in July. I'm pretty excited, and 15 year old Katie would be dying right now. I had some silly shrine made out of magazine-clippings on an entire wall in my bedroom in high school. It's rare for me to still love new music from artists I enjoyed so many years ago-- I usually wear out by now. She's one of the exceptions, though, and I've been obsessing a little about her new music. This first single is pretty awesome. Pinning: Home Inspiration like crazy. I am the world's worst at organization, but my next house is going to be neatly organized and semi-decluttered (I have a lot of nic-naks). Photographing: More dresses for the Reloved shop. I've been giving away clothes and selling clothes quite a bit lately. It's been feeling really good to simplify my closet. Eating: Pecan-caramel clusters! We have the cutest local candy store called Grandma's Candy Kitchen and they make the most delicious treats. We've been visiting multiple times a week lately. Cracking up over: This picture! First of all, it is SO HARD to get Johnny to smile for a picture. The guy just won't (or can't) do it. He finally does, and there is my crazy little tot going batty for a bite of yogurt. It's one of my favorite captures ever. 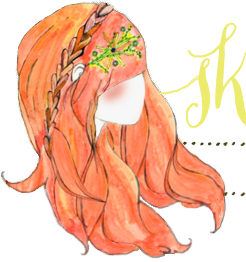 Working on: 'Tis the season for weddings, no? Well, I don't really know that for certain, but I am pretty booked up with wedding cake toppers right now. I just shipped a dino couple off to Colorado Springs and I am working on some owls, giraffes, and bears. Cake toppers are some of my favorite things to make! Here's a penguin that I just finished up a couple of weeks ago. She wasn't for a wedding, but sat on top of a wee one's birthday cake. 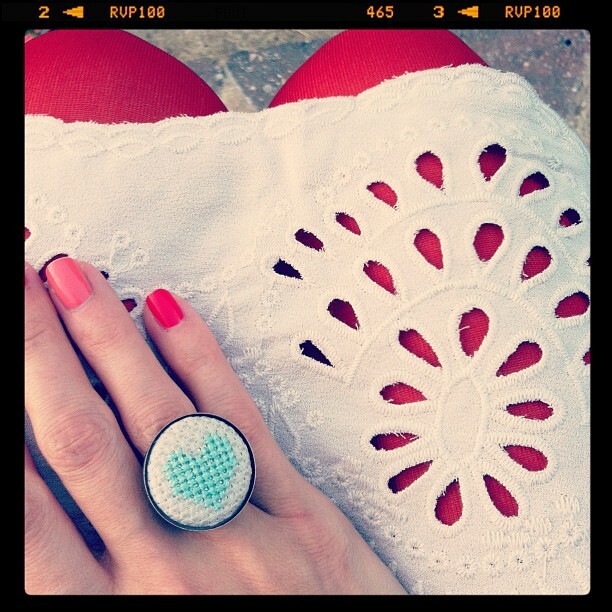 Wearing: This ring from Oh My Deer! almost all the time. It's so fun and adorable. This post was originally inspired by Danielle Hampton of Sometimes Sweet. Awwwwww Lucy's penguin!!!! It was EVEN cuter in person!!! Thanks again, Katie!!! 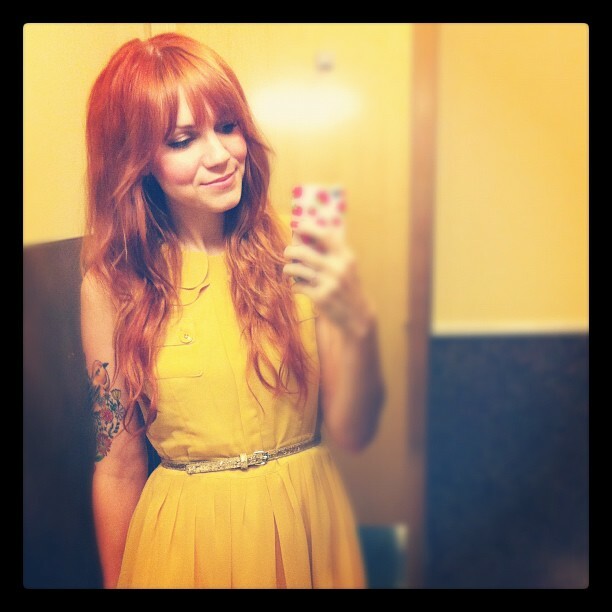 La la la LOVE that yellow dress and your perfect hair. JEALOUS. Oh, Fiona! I get to see her in July, too! Also, I just saw today that she's releasing a deluxe edition of her album (via Amazon), that includes sketches, etc. You are so gorgeous! And that picture has me cracking up too. Adorable! 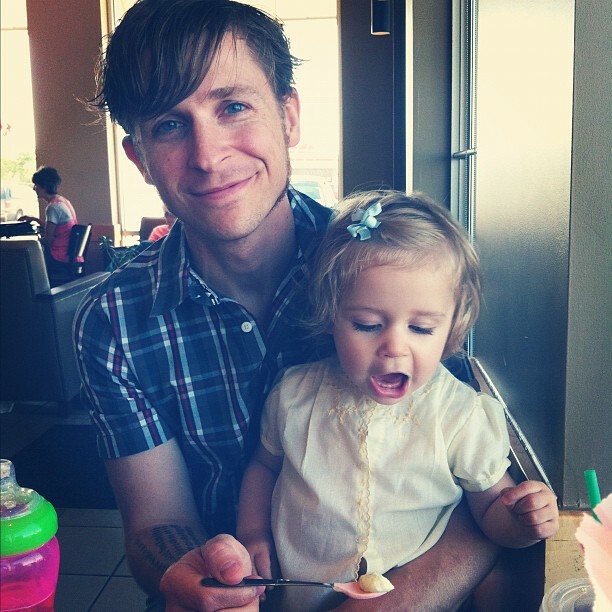 That picture of your husband and baby- GAH! Adorable. And also your hair is so purty. I love the way this post was done. I'm inspired to try one myself. You should do them more often. The dress is adorable and you should tell you husband that he should smile in photos more often, his face shows a lot of expression when he does. I loved it all especially that ring. Ohhhh, the penguin! So cute! Your husband has a lovely smile - tell him to use it more often! that picture is definitely awesome. you guys make an adorable little fam. Pretty jealous about the Fiona concert. I'm so excited that she has a new album coming out, though! Love that yellow dress in the first photo! Where is it from? Are you seeing her in Kansas City? Tidal was the first CD I bought (in 6th grade) and when I found out she was going to be two hours away from me, I freaked out. I bought my tickets within 5 minutes of them being on sale. Love her. oh fiona. my god her first video was racy for my teenage eyes! i was enraptured! i love her music! the only music i still love from my teen years are: smashing pumpkins, radiohead & oasis. i've evolved! That photo is amazing. He's saying "I love you love you love you" with his eyes! I saw Fiona play when I was 12! It was my first concert. She was great!! 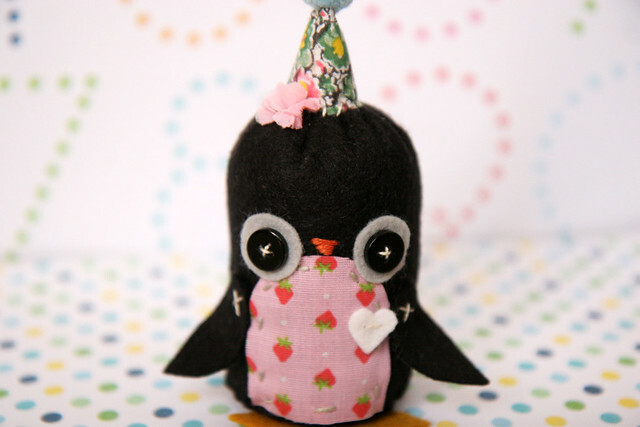 Would love to pin the penguin because he is so adorable but you don't have a Pinterest button. Im currently loving this entire post!!!! You look so lovely in that yellow dress! And the picture of your smiling husband and hungry tot is priceless. Great post. So Awesome!!! I love your cake toppers. So cute! Oh, and the ring - so fun. Thanks for sharing it. That photo is so funny and precious! And I'm envious of your seeing Fiona Apple! A favorite for sure. I am TOTALLY the same with Fiona Apple -- I am SUPER excited to see her in LA in July! :) I bought tickets as soon as they went on sale. I've been to a ton of live shows but Fiona is one of the few I still have to check off my concert "bucket list." WOO! I love everything on your list. And date night?! Always the best nights aren't they?! Hurray for Fiona Apple! And that penguin is to die for! Your penguin is soo sweet. I do like a bit of cross stitch (made a few pendants myself) - the ring is very cute. Oh my goodness, thank you so much for sharing that Fiona Apple track! I didn't know she still made music...I used to love her so much! Oh I just love your blog. And that dress you're wearing in photo #1? Awesome. I'm such a fanatic for yellow... Any ways. Hope your Monday is going well! Can't wait for the owls in the making. Definitely gonna buy one from you. My boyfriend loves owls and I love your creations!